1. Describe your teaching philosophy. First of all, good grades,which appear to be the end all for the student and parent really should be eliminated in elementary school. It is in elementary school that a child's self esteem is developed... how they view themselves for life. It is in a classroom where you experience validation that equates to self worth. Every time a teacher passes back a graded paper it is telling you whether you are "good" or not. You are too young to look at a test for what it is, or an assignment, and process that this has nothing to do with you, the whole complete person. Every time the child's hand doesn't go up to answer a question or solve a problem, that single event experienced continually throughout the day lessens self worth. The grades tell you, you are good, or you are not good. The student receiving the lessor grade feels less self worth than the student sitting next to them who is showing off the higher grade. The student that doesn't excel on tests, for example spends 15-20 years of their life in school rooms feeling inadequate. Then, at the end of the student's career in the classroom, they are expected to go out and be successful in "whatever." completely lost without self esteem or belief in themselves.... we have helped to create a person who becomes their own worst enemy......no self esteem. How could they have any self esteem... the system has been crushing them and telling them they do not have what it takes during their entire formative life. A parent telling a child they are "good" cannot erase the feelings experienced day in and day out in a classroom for 6 hours a day over the course of years and years. Rather, we should review students in how they demonstrate the Pillars of Character, assess them in their ability to work at something without quitting, being relentless and indefatigable, evaluate them in their abilities to work collaboratively, organizational skills and very important their communication skills,which should be a major component of their education. In summary, it is my teaching philosophy that all children need opportunities continuously to feel successful in the classroom, and it is the great teacher, like a director, who brings out the best in every child every day so that their self esteemed gets developed and it is not dependent on grades. 2. How do you teach and prepare students for standardized assessments? Naturally I follow the Common Core Standards, the pacing plans and the grade level curriculum. I try not to throw information at the students, but rather like Socrates, provide them with the information where they can go forth and provide answers and theories based on the critical thinking derived from the information I supplied to them. It makes learning fun and meaningful. Because they have "solved" the problems they can do more with the questions that these standardized tests ask of them. 3. Describe your discipline philosophy. I reward and recognize good behavior. I weave recognizing those individuals demonstrating good behavior throughout the day so much, that it becomes what the students want to do. It is often the student who has done poorly historically that will start the school year with learned poor behavior. Recognizing that it comes from a feeling of inadequacy, I don't recognize the bad behavior but look for any small demonstration of good behavior to reward it. Since this positive reward is so new to the child, but feels so great, new positive behavior starts to emerge. This may take time, but it is the only way to change poor behavior. To continue with punishment and negative consequences does not change the behavior. 4. How do you make sure you meet the needs of a student who is struggling? This is always a challenge, and the reality is that often the needs of the struggling student is not adequately met. This is a shame in the one size fits all approach in education. My goal is to provide as much one on one time for those struggling students in small groups. But in going along with my classroom philosophy, I work hard not to make the struggling student feel like a struggling student. I make sure they are aware of, celebrate and acknowledge their smallest accomplishments. I am always quick to point out the struggles I experienced as a child in school academically, constantly throughout the school year. I share with them all my amazing successes throughout my life that had nothing to do with my classroom grades, but rather my personal abilities that I possess that really are the important life tools. I make myself available to parents at any time of the day or night,before school, after school. I will come to the home, meet in the classroom, at a coffee shop, provide my cell and home telephone number, by text and email. Any concern that a parent has is my concern. I never want a parent going to sleep at night with any question or worry about their child. I am a parent with three children, all grown now, and I know that a concern with your child is of number one importance! 6. What advise would you give your community about education? Get involved in your school. Know the principal, sign up to help in the PTA, participate in school events and make your voice heard whenever you see it needed. Education in the class room does not make for a complete education. Talk to your child at the dinner table.. have real conversation. Talk in the car, take walks... read together...if you do watch TV do it together and talk about what you are watching... find out his/her opinion on things. You cannot have a close relationship with your child at 20 if you didn't lay the foundation at five or ten years old. 7. 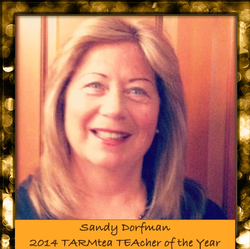 What does winning TARMtea Teacher of the Year award mean to you? First of all, it was such a shock! When I saw the other notable nominees, I never gave it another thought, as I never even thought winning was a possibility. It is embarrassing to have the spotlight on me, but I am so proud of being a teacher that I am grateful to have the opportunity to share my beliefs. 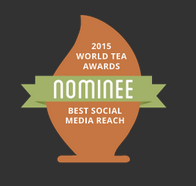 It is a special honor being recognized by TARMtea since I care greatly about what goes into mine and my family's body. I teach nutrition in my classroom because I am so passionate about helping to educate children at a young age. I have been a vegan for many years, and try to consume only organic "everything." I was shocked to learn that even though I was so meticulous about the fruits and vegetables that I was juicing, that I was ignorant to the fact about the amount and types of pesticides that were in the store bought teas that I drank,even from health food stores, not even giving it a thought. I just assumed all teas were healthy and never thought about how tea was grown. So winning an award from a company whose philosophy I so believe in is both a real honor and blessing to me.